So yeah, Uh remember me? Sorry about my extended break! Back to business! Hey! Yesterday I was invited along to Westfields London (that's the White City/Shepherds Bush one) to shop some of the Autumn Winter Trends. Westfields are launching a AW12 event kicking off on Thuresday with my favourite night of the Fashion calendar, Vouge Fashion's Night Out. You can find out all about the events on the Westfields website. While I was there we filmed a video that should be going live in the next few days so I'll keep you posted on that! They set me the task of styling out Metallics which excited me to no end! Metallic's is always one of my favourite autumn winter trends purely because I quite like how luxe but grunge it can look depending on how you style it out. Despite being popular for most of this year I really get excited with them when it comes to AW. I think it works so well on wintery pieces like, big chunky knits with metallic thread's to pair with sequinned shorts and metallic nail polishes. You can use it as a accent by pairing a pair of embellished shorts with a oversized black jumper or even adding a metallic peter pan collar to a simple t-shirt. Or you can me like me and do a full metallic outfit styled down for daytime with the slouchy fit jumper, boots and leather jacket. I think the key to daytime metallics is pairing it down with loose fitting jumpers block colours or accessorising them as accents to make it more subtle. As for nightime looks I'd just go as crazy as I could, nothing better than a bit of sparkle on a night out! Tonight, I'm wearing this outfit to some events and I personally think the look just oozes autumn winter cosiness with that luxe edge. Tomrorow I'm doing all sorts for Vogue Fashion's Night Out so I'll be around Central London (Bond Street etc) for most of the evening. If your around do come say Hi! I'll probably have had a few glasses of fizz by then so won't be such a awkward turtle! DISCLAIMER: Westfield's London invited me along for a filming and shopping session for content for their own website. They provided me with the credit to buy some of the items mentioned. As always, all thoughts are my own. Absolutely love this outfit, you've nailed metallics! I'm going to Westfields soon for the first time as I haven't managed to get down there yet, very excited! I love your style, the boots are heaven! your hair looks perfect in this post! Love this, esp the jumper and necklace. Yum! I bought a metallic skirts last winter that i love! Definitely considering investing in some more this winter! I really love this outfit! 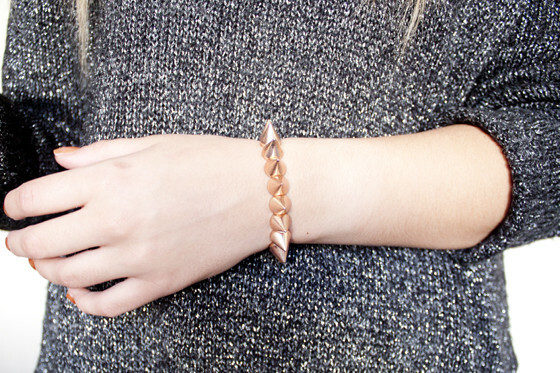 The different Metallic-Tones look so great together and fit you so well. Is that the jumper from divided? I really need something metallic for autumn! Absolutely love it ! I want this jumper and this skirt. If you need a break, you need a break. And actually taking it instead of forcing yourself to write is so good because you come back refreshed and not under pressure. I understand you blog for a living? If that's so, it becomes a duty as every other job and sometimes you just need to turn a blind eye. Btw, is anything still going to happen to your shop. Last year before your vacation and this year again you talked about redoing it and restocking and opening lots of new areas. Are you still planning to do so? I adore this outfit! At first I thought it's a dress but then I realized it's a skirt + jumper, so cute! Hahaha loved the last sentence. Wish I was near London, sigh. The clashing textures & metallic's are amazing. Yeah for winter style! Super rad look. hey girl heeey, glad to see you back! I thin you did a good job of pairing all of the different metallics (metals?) in this outfit. I definitely get the new autumn/winter coziness and luxe edge vibe from it. Definitely a great look for Vogue's Fashion Night Out! Have a great time! 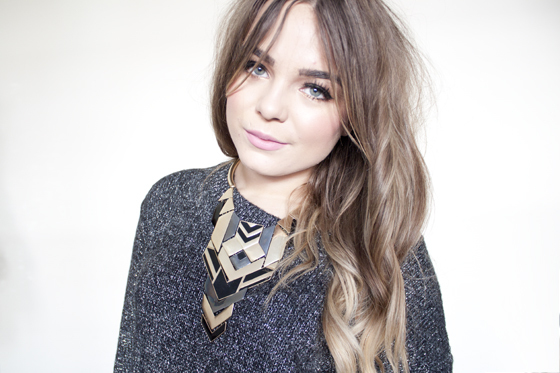 Loving the metallic sweater lovely and the gorgeous jewellery you've styled it with! so gorgeous, love that necklace. Love the metallics! I look forward to seeing the feature too! Hopefully we'll bump into you somewhere on Bond Street tomorrow! Woah! I love the mix of metallics! aw you are so lucky essentially getting paid to shop! i ADORE this outfit! i love how you've OD'ed on metallics with the clothes and nails and badass boots <3 and your hair and makeup is perfect, as ever. 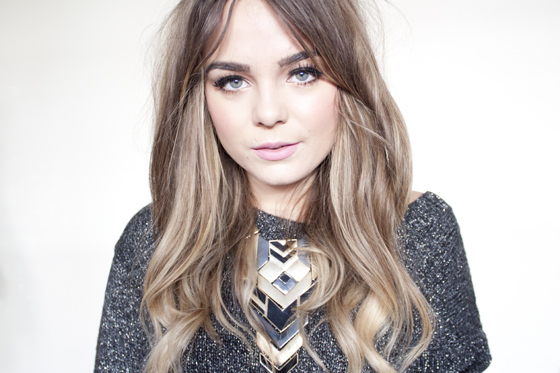 please tell me you have days when your hair/makeup just wont go right?! 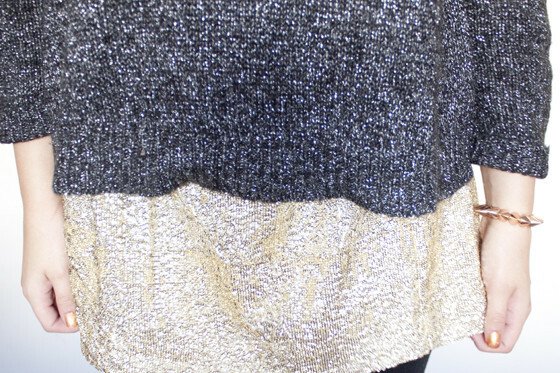 i also love lots of glitz on a night out,think i will always have a child-like love of sequins and glitter! have fun at the vogue night! Love love love, this look. Would never have thought to mix metallics like that. I love the whole outfit. I can't wait to see the vid. It looks lovely, I would never have enough courage to pull an outfit like that off though. You look amazing. Love this jumper and jacket combo. Also love these big neckalces, but too afraid to wear one, haha not quite sure if I can pull it off! Think I shall be wondering around Oxford St somewhere tonight! I love knitwear. Your sweater is cute! omgg that necklace is amazing!! Love the jumper and skirt :D i thought they were a whole dress! My favourite look of yours, maybe ever? LOVE the jumper... I must track one of those down! Just pretty. Pretty pretty! ohh i loove that necklace, beautiful! VIP bands and custom wrist bands for Crowd Control Events like concerts and custom parties. So exciting. Love the outfit. Most current features. Before downloading, http://www.cheatengine.me Engine APK application has a function. Opera Web browser for Windows Phone or even in Linux ioperamini Opera Mini permits the users to browse the web with utter simplicity. Low-voltage automated pool vacuums that clean the flooring Click Here This saves you on energy and chemicals compared with much less intelligent devices. A condenser dryer is a dryer that reuses voog dry air rather than venting it outside, blogger while a front loader washing is just a 10 Best Washing Machines washing that opens up from the front, Latest washers & dryers rather than the top as well as a condenser Get Info clothes dryer integrated into one hasslefree home appliance.